Nichiha fiber cement panels comprise a smooth, contemporary cladding that’s fast and easy to install, low-maintenance and super-durable. Designed for both commercial and residential applications, Nichiha panel installation creates a bold, modern look that doesn’t require the maintenance or upkeep often associated with traditional finishes. Engineered exterior cement panels are constructed with superior performance in mind to prevent rotting, warping and delamination. Nichiha panels are low-fuss and pest-resistant, keeping your building safe from termites. Because Nichiha panels are available in a wide range of styles, textures, and colors, it’s easy to mix and match to create a unique finish you won’t see anywhere else. Nichiha panels can effectively mimic the look of natural materials (metal, brick, fieldstone, sandstone, block and cedar) without the wear, tear and upkeep that these materials can require — and at a fraction of the cost. Panels are installed with aesthetics in mind; concealed clips and fasteners provide a clean, uninterrupted appearance that demands attention. Drainage. Panels are installed with an integrated rainscreen system to promote effective drainage in any climate. The exterior cladding deflects water and a vented drainage space allows moisture to drain or dry away from the wall system. This highly engineered back-ventilated moisture management system offers excellent protection against water intrusion and prevents damage to the wall components. Installation. Nichiha’s highly engineered installation system guarantees a shorter construction period, lowering the overall price. Panels can be installed over all of the most common substrates: traditional wood framing, concrete and masonry (CMUs), structural insulated panels (SIPs), and metal frame construction. Sustainability. Nichiha products are made of natural and recycled materials, including FSC wood pulp and fly ash, which diverts waste from landfills. 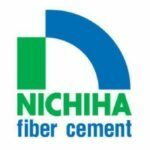 Nichiha complies with LEED Material and Resources Credit 4, which is of benefit to environmental builds, and 100% of the pre-cured fiber cement scrap is reused.